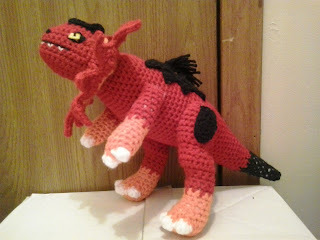 Magnasaur is another concept drawn up by one of my Etsy customers. Magnasaur would be considered a Fire-type Pokemon in the Pokemon game. Magnasaur looks a lot like Tyrantrum from Pokemon X and Y.
Worsted weight yarn: Red, white, orange, black, and yellow. Exsc = extended single crochet – insert hook one Rd below current Rd, YO, pull up loop, YO, and pull through loops on hook. Finish off leaving a long tail. Weave tail through sc of Rd 4, pull tightly and secure. Rw 2: Ch 1, turn; 2 sc in next sc, slip st in next sc, leaving remaining sc unworked. Finish off. Weave in ends. Repeat a second time of the other side of Rd 2. Embroider MOUTH, TEETH, and EYES of head of MAGNASAUR. Rw 1: Working in free loops of Rd 1 of BACK OF HEAD, skip next 2 sc, attach red, (ch 2, sc in second ch from hook, skip next sc, slip st in next sc) twice, ch 2, dc in next sc, tr in next sc, (dc, ch 2, slip st) in next sc. Rw 1: Working in free loop s of Rd 1 of BACK OF HEAD, skip next 7 from LEFT SIDEBURN, attach red, (ch 2, dc) in same sc as attachment, tr in next sc, dc in next sc, ch 2, slip st in next sc, (ch 2, sc in second ch from hook, skip next sc, slip st in next sc) twice. BEGIN STUFFING BODY AT THIS POINT. CONTINUE STUFFING FIRMLY AS YOU GO. Rd 44: (sc in next 3 sc, sc2tog) around. (12) Change to black. Finish off leaving a long tail. Weave tail through sc of Rd 55, pull tightly and secure. Weave in ends. Rd 6: (Ch 8, sc in second ch from hook, sc in next ch, hdc in next ch, dc in next 2 ch, tr in next 2 ch, skip next 6 sc, slip st in next sc) 9 times. Finish off. Weave in ends. Using black, embroider spots on FRILL. Sew BODY to HEAD. Finish off leaving a long tail. Sew LEGS to BODY. Finish off leaving a long tail. Sew LEG MARKINGS to LEGS while embroidering side points. Rd 8: sc2tog, sc in next 7 sc. (8) Change to red. Finish off leaving a long tail. Stuff ARMS firmly. Sew ARMS to BODY. Rd 4: slip st in next 2 sc, ch 4, sc in second ch from hook, hdc in next ch, dc in next ch, skip next 3 sc, slip st in next sc, (ch 4, sc in second ch from hook, hdc in next ch, dc in next ch, skip next 5 sc, slip st in next sc) twice, ch 4, sc in second ch from hook, hdc in next ch, dc in next ch, skip next 3 sc, slip st in next 2 sc, ch 4, sc in second ch from hook, hdc in next ch, dc in next ch, skip next 3 sc, slip st in next sc, (ch 4, sc in second ch from hook, hdc in next ch, dc in next ch, skip next 5 sc, slip st in next sc) twice, ch 4, sc in second ch from hook, hdc in next ch, dc in next ch, skip next 3 sc, slip st in next sc. Finish off leaving a long tail. Sew BACK SPOT to BODY. Fringe on pieces of black on center of BACK SPOT. Tyrantrum and Pokemon are copyright Nintendo and their respective creators. This crochet pattern is an original pattern and is © by Christjan Bee (April 2018). Please do not claim this pattern as your own. If you wish to share this pattern, you may link to this pattern but please do not reprint/repost it on your site. You may print and keep a copy for your own personal use, but you may not sell or distribute it, or sell items made from this pattern.